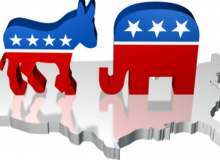 In this quiz it will show you whether you are a Liberal (Democrat) or a Conservative (Republican). You are going to be given a subject and you will read the answers given and choose one. If you answer the question "correct" you have a conservative belief, if answer the question "incorrectly" then you have a liberal belief. At the end of the quiz it will show you the percentage you received. If you have a high percentage you are more Conservative, and if you have a lower percentage like 50% and under you are more Liberal. LIBERALS – Generally believe in governmental action to achieve equal opportunity and equality for all, and that it is the duty of the government to reduce community issues and to protect civil liberties and individual and human rights. Also believe the role of the government should be to guarantee that no one is in need. CONSERVATIVES – Generally believe in personal responsibility, limited government, free markets, individual liberty, traditional American values and a strong national defense. Also believe the role of government should be to provide people the freedom necessary to pursue their own goals. A woman has the right to decide what happens with her body. Due to prevalent racism in the past, minorities were deprived of the same education and employment opportunities as whites. Individuals should be admitted to schools and hired for jobs based on their ability. It is unfair to use race as a factor in the selection process. The free market system, competitive capitalism, and private enterprise create the greatest opportunity and the highest standard of living for all. A market system in which government regulates the economy is best. Government must protect citizens from the greed of big business. School vouchers create competition and therefore encourage schools to improve performance. Public schools are the best way to educate students. Oil, gas and coal are all good sources of energy and are abundant in the U.S. Oil drilling should be increased. Change in global temperature is natural over long periods of time. Global warming is caused by an increased production of carbon dioxide through the burning of fossil fuels (coal, oil and natural gas). Less Regulations / fine how it is. Everyone should be able to have it--universal health care. Private insurance with fewer regulations. Legal immigrants and American citizens, only. Support legal immigration. Support amnesty for those who enter the U.S. illegally (undocumented immigrants). Respect ownership and private property rights. Support the separation of church and state. The Bill of Rights implies a separation of church and state. The phrase “separation of church and state” is not in the Constitution. The First Amendment to the Constitution states “Congress shall make no law respecting an establishment of religion, or prohibiting the free exercise thereof…” This prevents the government from establishing a national church/denomination. The Social Security system should be protected at all costs. The Social Security system is in serious financial trouble and isn't sustainable. Lower taxes and a smaller government with limited power will improve the standard of living for all. Higher taxes (primarily for the wealthy) and a larger government are necessary to address inequity/injustice in society (government should help the poor and needy using tax dollars from the rich). The UN promotes peace and human rights. The United States has a moral and a legal obligation to support the United Nations (UN). The U.S. should not act as a sovereign nation, but as one member of a world community. The UN has repeatedly failed in its essential mission to promote world peace and human rights. The wars, genocide and human rights abuses taking place in many Human Rights Council member states (and the UN’s failure to stop them) prove this point. History shows that the United States, not the UN, is the global force for spreading freedom, prosperity, tolerance and peace. Global warming, not terrorism, poses the greatest threat to the U.S., according to Democrats in Congress. Terrorism poses one of the greatest threats to the U.S. The world toward which the militant Islamists strive cannot peacefully co-exist with the Western world. In the last decade, militant Islamists have repeatedly attacked Americans and American interests here and abroad. Oppose long-term welfare. Opportunities should be provided to make it possible for those in need to become self-reliant. Support welfare, including long-term welfare. Welfare is a safety net which provides for the needs of the poor. Consider a universal basic income.